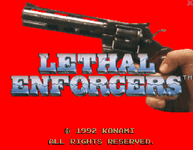 Lethal Enforcers is a 1992 shooting game released for the arcades by Konami. It is best known for its revolver-shaped light gun known as the Konami Justifier, its digitized graphics, and the controversy over its content. Home versions were released for the Super NES, Sega Genesis and Sega CD during the following year. The home versions makes use of a revolver-shaped light gun known as the Konami Justifier, which came packaged with the game. A standard controller can be also used in lieu of the light gun in these versions. A second-player Justifier light gun, pink in color, was available only by mail order from Konami, and is very hard to find today. Lethal Enforcers was followed by Lethal Enforcers II: Gunfighters. The Japanese arcade game Seigi No Hero was localized to Western markets as Lethal Enforcers 3. The game is also featured alongside Lethal Enforcers II in the two-in-one compilation titled: Lethal Enforcers I & II (Lethal Enforcers Deluxe Pack in Japan), released for the PlayStation in 1997. Set in Chicago, Illinois, United States The player takes control of a police officer named "Don Marshall", who has one day decided to go to the donut shop for a break. While sipping the last drop of coffee, he gets a call from the police department. They said that a major crime organization has invaded town, and they need his help. He is one of the two survivors of the elite group of officers. The rest have ended up in the hospital or killed. Once the call ended, he decided to check out the bank. From that point on, he's going to experience the toughest job that he'd had during his years in the police force, He has been assigned and agrees to help stop a growing crime wave that puts the city's security in serious jeopardy, along with a helper (A second player can join in). Initially armed with a standard-issue service revolver, the player can acquire upgraded weapons during the course of play: a magnum revolver, an automatic pistol, a shotgun, or an assault rifle. When the player loses a life, his weapon reverts to the basic service revolver. Bad guys always wear sunglasses or masks, while fellow police officers and innocent bystanders are always barefaced. Source: Wikipedia, "Lethal Enforcers", available under the CC-BY-SA License.